Another centre forward for Latics? So said a Lancashire Evening Post headline on Saturday. The article went on to explain that Paul Cook was initially aiming to take Eion Doyle from Preston North End to Portsmouth, but that the centre forward’s new destination “might now be” Wigan. Sometimes newspaper headlines can be pure speculation, but this one seemed to be well within the realms of possibility, if by no means confirmed. The 29 year old was on loan at Portsmouth in the second half of last season and previously played under Cook’s management at both Sligo and Chesterfield. But Paul Cook is known to favour the lone centre forward system and Wigan Athletic already have five of them on their books. Do they really need another? But managers do sometimes like to bring in players who have been with them in the past. Indeed Warren Joyce signed three in January – Gabriel Obertan, Ryan Tunnicliffe and James Weir – who were with him at Manchester United. Long will Latics fans remember the hapless Jason Scotland who had scored 53 goals in two years at Swansea under Roberto Martinez, but could muster only 2 in 36 appearances after the Catalan took him to Wigan. The Premier League had proved to be too big a step up for the Trinidadian. But Doyle is a different matter. He was an important player for Cook at Chesterfield, scoring 38 goals for him in 64 starts and 20 appearances off the bench. Indeed 21 of those goals had been scored at League 1 level in little more than half a season before he was transferred to Cardiff City at the beginning of February 2015. Admittedly Doyle’s goalscoring record since leaving Chesterfield has been less impressive, but it would be a surprise if Cook is not considering an offer for the player. But Latics already have central strikers who could make a major impact on League 1 next season. If Doyle were to be brought in which ones would depart? Will Grigg has scored in excess of 20 goals per season three times before in the third tier. His critics will say that he could not make the step up to the Championship last season, his last league goal being scored in September 2016. However, his supporters will say that the player had made a good start and looked comfortable at that level, only to be left on the bench or played out of position by his managers. But Grigg has just one year of his contract remaining and the likelihood is that Latics will invite offers over the summer, looking to recoup the £1m they paid Brentford for him a couple of years ago. Omar Bogle we hoped would be the key figure in all of Joyce’s January signings. Full of confidence from his goalscoring exploits at Grimsby, he started off well, but he was to find Championship defenders a different kettle of fish to those in League 2. Injury also played its part in the player not making the impact that was hoped. However, although Bogle as a player is still a rough diamond in need of polishing, he has the physique and technique to be a top player. He is capable of making a major impact on League 1 if he can overcome his fitness issues. Nick Powell‘s appearances near the end of last season showed his huge talent. 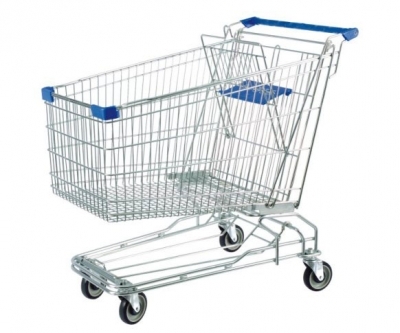 Although he prefers to play in midfield, he can be devastating at centre forward. It could be argued that Latics would never have been relegated if Powell had been fit all season, giving his quality. But that was not a likely scenario, given his injury woes over recent years. If fit, Powell could take League 1 by storm, but therein lies the question. Would the club want to continue to pay a high-end salary to a player whose fitness is so uncertain? Powell put himself in the shop window with his displays over those closing weeks. There will surely be another club willing to take a gamble on a player of such quality. Mikael Mandron was signed from Eastleigh Town in January. He had scored goals in the first half of the National League season and was known to Joyce’s assistant, Andy Welsh, through his time at Sunderland. He made just one start and two substitute appearances early on, but did not feature again after mid-March. Only 22 years old, Mandron could well be sent off on loan to gain further experience. Billy Mckay remains a Latics player, although things never worked out for him at Wigan or on his loan at Oldham. But Mckay has a record of success in Scotland. He returned to his old club, Inverness Caledonian Thistle, on loan in January. It would not be a surprise to see Mckay complete his contract at Wigan with a further loan spell in Scotland. A return to the Latics squad would be a surprise, but by no means impossible. The “PNE striker bound for Wigan?” headline might have been speculative to some degree, but Doyle’s arrival might well come to fruition. Can Latics afford to keep Chris McCann? Whether McCann stays or not will provide an indicator on Wigan’s financial outlook for the future. Norway is a country that prides itself on financial transparency. In fact you can go online and look at the earnings that people post on their tax returns, the Prime Minister included. But obtaining hard facts on player earnings at English football clubs is quite the opposite. Individual player salaries tend to be closely guarded by clubs who want to keep such things under their hats, for their own sakes as well as those of the players. Since salaries are so rarely divulged we usually to have to make guestimates for the figures involved. According to the Daily Mail the average basic yearly salary for a Championship player in 2014-15 was £324,250. It was £69,500 in League 1. Using those basic figures and assuming a first team squad of 25 players it would have cost an average Championship club around £8.1m that season for its basic wage bill for its senior players, let alone for bonuses and appearance money. Together with salaries of other players and staff and the general running costs of the club, the figures would most likely top £10m. A comparable figure for the average League 1 club would have been around £2.5m. Chris McCann and Leon Barnett were signed by Owen Coyle in the season of 2013-14 when Wigan Athletic’s annual running costs were around £30m. Simple calculations suggest that most of the senior players in that squad would have been earning salaries around £1m. According to an article in the Star a couple of weeks ago it was Sheffield United, not Wigan Athletic, who had the highest player salary costs in League 1 this past season. They estimated it to be around £6m. If the Star’s estimate is correct it means that Latics operated on a salary bill no more than £6m last season, remarkable given that the combined salaries of Barnett and McCann would most likely have been between £1.5m and £2.0m. It suggests the remaining players were earning a fraction of the wages of the two Coyle recruits. Last summer Wigan Athletic did a remarkable job in preparing themselves for the financial realities of League 1, following a 12 year period in the Championship and the Premier League. Players on Championship salaries were jettisoned for knockdown prices, whilst others were sent out on loan. Whether Barnett and McCann remained due to their value to the squad or that no acceptable offers came to them is open to conjecture. In the event Barnett had an indifferent season and will be going elsewhere. McCann on the other hand became a key player in the promotion season, given his flexibility in adjusting to playing in different positions. The club has announced that it is offering McCann a new contract. The snag is that the salary on offer would mean a substantial pay cut for the Irishman. Given that he is a proven performer with a wealth of experience in the Championship he is likely to attract interest from other clubs in the division. The arrival of Owen Coyle at Blackburn could be a factor. McCann played under the Scot at Burnley before joining Coyle’s Latics. Moreover judging by their profit and loss accounts over the past seasons the East Lancashire club are not averse to offering attractive salaries. Should McCann leave Wigan there will be fans who will question his loyalty. But the likelihood is that he will leave. There are at least three other players who still belong to Wigan who will still be on their previous Championship-level salaries. They are the loan players – Emyr Huws, Billy Mckay and Andrew Taylor. But the kinds of salaries that Latics will want to offer this coming season might not be in line with what those players were used to earn before going on loan. Having had wage bills of £30m in the Championship in 2013-14, then £20m in 2014-15, what kind of figure will Latics be aiming towards for the season ahead? Wigan will be buffered by their final parachute payment in excess of £12m. However, the club does not have a great record in raising commercial revenues and gate receipts are likely to be well below the average for clubs in division. Offering low cost season tickets is a great way to foster goodwill among supporters and it could be argued that the lower prices will bring more people in, compensating for a reduction in price. However, there are questions about whether such a stance can be maintained without the cushion of parachute money. Even in their heyday in the Premier League the club struggled to reach an annual £3m in gate money. Latics might stretch to a wage bill of around £15m for the coming season, but they must tread with caution with regards to salaries offered and lengths of contracts. The prospect looms of making significant losses two to three years from now. Given these factors offering McCann a one year deal on a salary compatible to that of which he has become accustomed would be possible. But a contract of two to three years on such terms would be risky. Last summer the staffing policy was clear – get rid of the highest earners and bring in players of sufficient quality to get the club out of League 1, but halving the wage bill. This summer it is not so clear. Does the club take the gamble of going for outright promotion or does it keep an eye on what are the longer term implications for its financial future? Whether or not Chris McCann signs a new contract will provide us with a major indicator as to where the club intends to be heading over the coming years. Will Grigg has been on fire but the dust has now settled on Wigan Athletic’s achievement of winning League 1. Now it is time to look ahead to the start of the Championship season on August 6th. Gary Caldwell will surely be relieved that he will not have to go through the massive restructuring of last summer. But at the same time he will know that the current squad will need strengthening if Latics are to hold their own in the higher division. At least half a dozen reinforcements are likely to be brought in. Caldwell’s immediate priority will be to deal with players out of contract and players who have come in or gone out on loan. Caldwell has already secured the services of Stephen Warnock for the next couple of seasons following a very successful loan from Derby County. Warnock has looked a class act in League 1, whether playing as a left back or on the left side of a back line of three. However, he is 34 years of age and it comes as a surprise that a contract of more than a year was offered. Rumours also suggest that Caldwell is trying to tie up a deal with Everton for Conor McAleny. The 23 year old scored 4 goals in his 9 starts and 4 appearances as a substitute since joining Wigan on loan in January. McAleny’s career has been dogged by injury, but Caldwell must feel reasonably confident that the player can maintain a good level of fitness. McAleny can hit the ball as hard as anyone, as evident on the screamers he scored at Walsall and Shrewsbury. Haris Vuckic is the third loan player who finished the season for Latics. The 23 year old Slovenian has a great left foot and can both score and create goals. The question mark over Vuckic has been his fitness. He made 5 starts for Latics, but never completed the 90 minutes. Vuckic has reportedly gone back to Newcastle and given his inability to establish himself at Wigan it is unlikely he will be sought after by Caldwell. Caldwell has the option of bringing back three players who were packed off on loan to other clubs at the start of last season. With Reece James and Stephen Warnock, Latics do not need another left back, so it is likely that Andrew Taylor will once again be sent away on loan until his contract expires in June 2017. Billy Mckay was given minimal opportunities at Wigan, but has scored 12 goals in 28 starts for Dundee United who finished bottom of the SPL. However, it is reported that there is interest in him from other Scottish clubs and it is unlikely he will return. The prospect of Emyr Huws playing in midfield with the likes of Max Power is mouth-watering, but it appears that he might have burnt his bridges at Wigan. Huws is a combative midfielder who oozes class, but comments attributed to him as not wanting to play for Latics when they were going down to League 1 were unfortunate to say the least. Moreover it appears that the ankle problem the player suffered at Wigan has continued to plague him. Huws has another two years to run on his contract and the likelihood is that Latics would accept any reasonable transfer fee put forward. There are seven players out of contract. Both Leon Barnett and Chris McCann were recruited by Owen Coyle in the days when the club’s annual salary bill was well above what we can expect for the near future. Barnett is an experienced ex-Premier League player, but has found it difficult to adjust to the possession football that Caldwell demands. McCann on the other hand has thrived under Caldwell. The Scot has not only called on him to play in the centre of defence as he did at times under Uwe Rosler, but has reinvented the big Irishman as a wing back. Although Barnett’s stay at the club looks to be coming to a close, Caldwell will be keen to retain McCann, although he will have to ask the player to take a significant salary cut if he wants to stay. Reece Wabara was signed on a short term contract in January, since when he made 14 starts with 3 appearances off the bench. Although Wabara has by no means played badly, neither has he convinced us that he must stay. Wabara is already being linked with other clubs and rumours suggest he is on his way out of the club. Kevin McNaughton missed most of the season out through injury and although the 33 year old Scot is an accomplished full back it is unlikely Caldwell will offer him a further contract. The positions of three younger players who are out of contract are unclear. The 23 year old goalkeeper Lee Nicholls has amassed nine league appearances over his five years or so at the club. He has had loan spells at six clubs, his most successful being in 2012-13 when he was an ever-present for Northampton Town. Fan opinions on Nicholls vary. Some say that he is the kind of commanding keeper that Latics need and that successive managers have never given him the chance he has deserved. Others cite a lack of concentration, that some of the goals he has conceded should have been easily saved. Rarely has the rift in fan opinion been more apparent than in the last game of the season. On the Vital Latics forum 18% of readers voted him ‘’Man of the Match’’ whereas others slated him for all four Barnsley goals. The signing of young Dan Lavercombe from Torquay in January could prove a key factor in the decision whether or not Nicholls will be offered a new contract. The other two young players whose contracts are due to expire are Jordan Flores and Ryan Jennings, both 20 years old. It was always going to be hard for young, inexperienced players to break their way into a team aiming for promotion. Both have certainly showed promise, although only Flores played in league games this past season. He made two league starts, both in September, scoring a fine goal against Fleetwood but getting sent off at Oldham a week later. Flores has had injury issues, but he has a great left foot and shows some silky skills. Jennings made his senior Latics debut as a substitute in the League Cup game against Bury and has been on loan at Grimsby and Cheltenham, making a total of 9 starts and 9 appearances as a substitute. So what are the areas that need strengthening? David Sharpe has recently made it clear that Latics will not be spending big money to bring in players in their late twenties or beyond. However, that does not preclude money being spent on young players who have already shown what they can do at other clubs. Any more experienced players coming in are likely to be free agents or those available at knockdown prices. With Jussi Jaaskelainen now 41 years old, Caldwell is likely to seek an experienced goalkeeper to challenge the Finn for his place. Rumours suggest that they will once again try to sign the 32 year old Andy Lonerghan. 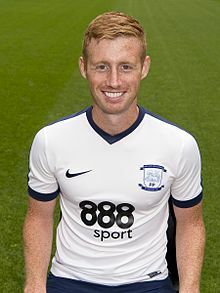 The ex-Preston and Bolton man has a wealth of experience and is midway through a two year contract at Fulham. Right back was a problem position last season and Caldwell will be keen to recruit someone who can fill the bill. Donald Love (21) could be that player should Latics be able to persuade Manchester United to part with him for a reasonable fee. Love’s loan spell at Latics was interrupted by injury and call-ups from the Scotland under-21 team, but he did enough to suggest that he would be a good investment for Wigan. Caldwell will also be looking for a quality central defender with the speed to cope with pacey Championship forwards. With the likely departure of Barnett it will be a priority. Rumour suggests that Latics are interested in the 31 year old Darren Pratley, a holding midfielder with a wealth of experience with over 300 appearances under his belt at Swansea and Bolton. Together with the 22 year old Danny Whitehead, signed from Macclesfield Town in January, Caldwell would be adding a balance of youth and experience to his midfield if he were to sign Pratley. Caldwell will also seek another centre forward. Much depended on Grigg last season and Latics need alternatives in case he is called up for international duty or injured. Craig Davies had his most injury-free season for some time, but was only used as a substitute in the second half of the season. Caldwell will broaden his options by going for a third central striker. Should Vuckic not be returning, another left footed winger/creative player would help maintain a balance. Ryan Colclough, Michael Jacobs, Conor McAleny and Yanic Wildschut are all right footed although Andy Kellett can play a left footed role on the right of midfield. Caldwell and his recruitment team have done a fine job over the past year. Their next challenge is to find half a dozen new recruits who can add further balance to a squad that is going to have to come to grips with playing at a higher level this coming season. Gary Caldwell’s transformation of Wigan Athletic’s style of play took another step forward in a competitive contest at Dens Park. Dundee and Latics were well matched and the 1-0 result to the home team did not do Latics justice. It was another very competent performance from Caldwell’s new team, with lots of good football supplemented by a determined approach. Last season’s SPL placings might suggest that Dundee and Partick Thistle were close, but Dundee had finished sixth in the “round robin” part of last season, having to play their final ten matches against the top five teams. Moreover they had a reputation of being a more physical team than Thistle. This proved to be the case last night when tackles came flying in at times. In a league game the home side would surely have finished with a handful of yellow cards. However, this Wigan team is not to be intimidated as it too often was in the Championship. Latics were prepared to get “stuck in”, although within the latter of the law. Dundee itself has transformed since my time living there. There is a positive buzz around the city with lots of new building projects going on and a very significant improvement in the standard of housing. It is a city on the up. The same cannot be said of Dundee FC. In the 1970s I enjoyed many visits to Dens Park, when the memory of the club’s lifting of the Scottish League title was still with them. A 2-0 victory over AC Milan at Dens in the UEFA Cup remains a fine memory. But since then the club has fallen on hard times, with seemingly constant financial difficulties. Dens Park is no longer the proud venue it was. Its infrastructure is falling apart, with sections of the ground sealed off and a main stand that is antediluvian. Caldwell once again opted for a 3-5-2 formation. Richard O’Donnell took over in goal. Donervan Daniels played on the right hand side of the back three, with Chris McCann on the left. Andrew Taylor was surprisingly played in the centre of the back line. Against lower division English teams it would not be such a viable option, but knowing that Dundee were going to play the ball largely on the ground, Taylor’s lack height would not be an issue. Kevin McNaughton and Reece James were at wing back, with Francisco Junior playing in front of the back three and Tim Chow and Max Power further forward in midfield. Caldwell fielded for his potentially optimal front line pairing of Craig Davies and Will Grigg. Dundee started in a lively manner but Latics’ front men were soon working hard, ruffling the home team defence. Although Wigan generally tried to build up their moves from the back, they were not afraid to put aerial passes through to Davies in particular. The big man was looking lively and managed to evade the home defence after 15 minutes, being stopped by a sliding tackle. However, he continued to be involved and his neat interchange with Grigg led to the latter being fouled as he moved towards goal. Sadly Grigg skied his penalty way over the crossbar. Caldwell was clearly taking the issue of Davies’ fitness seriously, given the player’s problems last season. The big man was taken off after 30 minutes, with David Perkins coming on, Chow and Power being pushed further forward. Power had been full of enterprise, but some of his moves did not quite come off. The tackles came flying in from the home team, but Latics were undeterred. Power went in for tough 50/50 ball and clearly came off the worst, leading to him going off after 40 minutes, being replaced by Ryan Jennings. Caldwell continued with the same lineup after half time, with Junior once again oozing with class in holding midfield. James had looked lively on the left and his outswinging corners were causing the home defence problems, McNaughton forcing a save from the keeper, before heading narrowly over, as did Daniels. The big West Indian had been a little wayward in his passing early in the game, but was a major contributor in defence, his speed and physical strength coming to the fore. On 60 minutes Caldwell replaced Chow, Grigg, Junior and McNaughton with Jonjoe Kenny, John Lundstram, Billy Mckay and Samni Odelusi. Odelusi sadly strayed offside with a chance being wasted. Kenny was soon to show his blistering pace in a counterattack, with neither Mckay nor Odelusi able to convert his excellent cross. Latics’ wing backs had been pushed far forward, acting almost as wingers. Lundstram was gradually getting into the game and Odelusi looked lively. Mckay was not at his best with his final touch. Perkins was lively as ever, winning the ball and moving forward. Jennings could not repeat his fine performance at Partick, but will surely challenge for a place. Dundee were to get the breakthrough on 70 minutes as an exposed Latics defence left a gap on the right, with Loy converting. Daniels was replaced by Craig Morgan after 77 minutes after putting in a good shift. 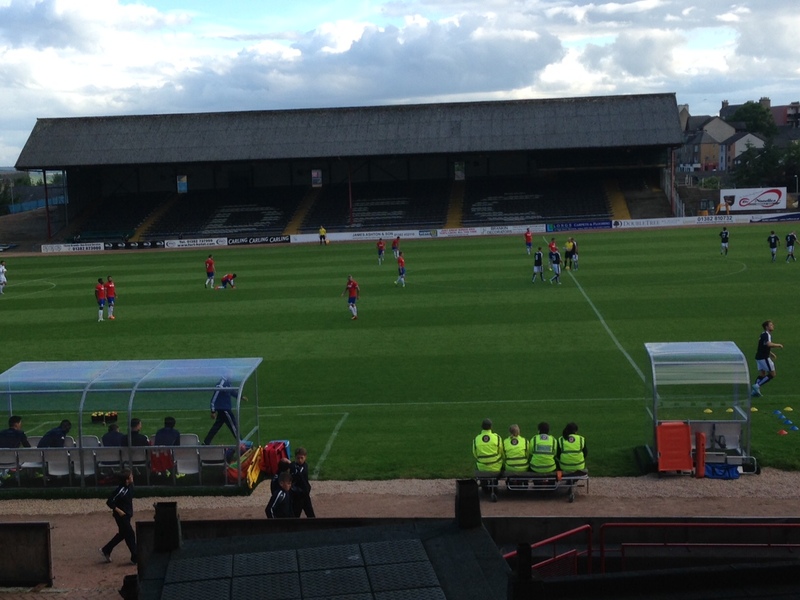 Dundee were restricted to long range efforts from outside the box. Odelusi went close with a left footed drive in the last minute, but Dundee were to hang on for a win they scarcely deserved. Apart from the goal, Latics’ defence has been solid. Indeed O’Donnell’s first save came in the 90th minute. McCann was excellent once again, as he had been against Partick Thistle. The much maligned Taylor gave a professional performance in the centre of defence. In front of his home town crowd, McNaughton had seemed subdued in the first half, but was more involved in the second until taken off. He and Kenny are very different kinds of players and it gives Caldwell options in the right wing back position. It remains to be seen whether McNaughton will be offered a contract. Caldwell will be getting closer to deciding on his first choice lineup. It will be interesting to see if he sticks with his midfield formation with one player sitting in front of the defence and two pushed further forward. Junior and Perkins are the prime candidates for the role in front of the defence, with Power the most likely in the role of midfield creator. Chow, Flores, Jennings and Lundstram and are also candidates for midfield places, as is McCann if he stays at the club. Davies will be carefully nurtured, but one wonders if he will be fit for the opening league game at Coventry. Although he has not yet taken advantage of scoring opportunities, Grigg looks a fine player for League 1 and will surely make his mark. Mckay remains a work in progress, his confidence surely damaged by the shoddy treatment he received under Malky Mackay. Playing just a hundred yards from Tannadice Park there would surely have been a Dundee United presence at Dens Park last night. Mckay was regularly scoring goals at Inverness, playing as a lone centre forward. The Dundee United interest is therefore no surprise. James Perch has not appeared in either match in Scotland, leading to speculation of an imminent departure. But the player might well be injured. Although Caldwell already has the nucleus of a useful squad in place there may well be more surprises to come. Reports suggest that Wolves winger Michael Jacobs is close to signing and rumours persist about Swindon wing back Nathan Byrne. The failure of the new players to gel was to eventually prove fatal to Latics last season. It will be a major issue for Caldwell, but having a clearly defined style of play is surely helping his players to adapt. The current mood is clearly positive and there are grounds for optimism. However, no matter how well the pre-season has gone it is going to take time for the team to fully gel and the results to come. We need to be prepared for some ups and downs over the coming weeks. As the saying goes “Rome was not built in a day”. 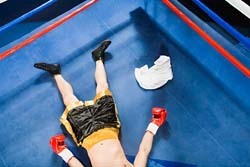 When a boxer is too beaten up to continue, his coach throws a towel into the ring to signal that the fight is over. Gary Caldwell might have wanted to throw in the towel at various times during an awful performance at promotion-chasing Brentford. The unfortunate deflection of a Pritchard free kick after 25 minutes was the precursor of the nothingness that followed. Latics had dominated the game up to that point, at least in terms of possession. But a team with such brittle confidence was unlikely to be up to the task of getting back into the game following such an unfortunate goal. Gary Caldwell set up his stall with a 3-5-2 formation. It worked well for the first quarter of the game with the wing backs getting into advanced positions, particularly Gaetan Bong on the left. The team pressed forward to harass Brentford’s passing game. Wigan’s passing was neat and their interplays led them into the Brentford box on various occasions. One had a feeling that something positive might happen, even of the incisive final pass was lacking. It looked like Caldwell had got the team playing the kind of football he was seeking. But as the game progressed following that first goal one got the feeling that Latics could be in for a drubbing. The Latics back three looked like they had never played together before, fragile and vulnerable to the movement of the Brentford midfield and wide players. Wigan’s midfield was both pedestrian and predictable. The forwards found it hard to stay onside. But then again, what did Latics have to play for in the last match of a catastrophic season? The majority of the players who made the starting lineup are unlikely to be at the club next season. But at least Caldwell had taken the opportunity to give Billy Mckay his first start, together with bringing the 18 year old Louis Robles and the 19 year old Jordan Flores off the bench for their first senior appearances after 64 minutes. The breath of fresh air that Caldwell’s appointment has brought into the club was not enough today. The Scot has inherited a poor team that was never going to be good enough to beat promotion chasers like Wolves and Brentford in the last two games. But if that deflection had not beaten Lee Nicholls half way through the first half, perhaps a goalless draw might have been on the cards today? The social media and message boards have been packed with fans asking which of the players whose contracts are expiring next month should be offered new contracts. On the basis of today’s performances alone the answer would quite simply be “none” except the goalkeeper. The highlight of the afternoon for Wigan was Lee Nicholls’ late penalty save. With the impending departure of both Ali Al-Habsi and quite probably Scott Carson it is no surprise to hear strong rumours that the young keeper has been offered a contract extension. It is a measure of how far Latics have fallen over the past months that Brentford could so easily carve holes into the defence as the game wore on. The kind of football they played today is something that Caldwell might well aspire to. The Scot has a mountain of a task ahead of him to get Latics back to that level of performance. Meanwhile we will continue to play our guessing games as to who is to stay and who is to go. It is going to be an interesting summer!